On October 3rd – 6th, 2006, the third year of the international theatrical festival KAPAT FEST 2006 took place. It was financially supported by the Slovak Ministry of Culture and organised by the Friends of Alexander Dukhnovich Theatre Association and the Alexander Dukhnovich Theatre (DAD – Divadlo Alexandra Duchnovica) itself. Apart from the host theatre and the Jonas Zaborsky Theatre from Prešov, the following theatrical and dance groups performed at the festival: the dance group Blesk from Banska Bystrica, the Peter Riznic Theatre ĎAĎA from Rusky Kerestur (Serbia), the Wanda Sjemaszkowa Theatre from Rzseszow (Poland) and the Regional Ukrainian Musical-Dramatic Theatre of Olga Kobîlanska from Černivce (Ukraine). As a part of the festival, apart from the performances on the stage of DAD, the theatrical group from Ukraine also performed for audiences in Bardejov and the actors from Rusky Kerestur gave a performance in Sabinov. The members of the theatrical groups spent the late evenings at discussion forums, which took place at the Fringe Stage of DAD and were entitled Pod reflektorom (In the spotlight). We can use this sentence to briefly characterise probably the most controversial and, at the same time, the most famous personality of the Rusyn Revival Movement, which started after the Velvet Revolution in 1989 – Vasil TUROK-HETEŠ. On June 14th, 2006 (according to the secular calendar, Vasil celebrates his nameday on this day), a memorial plaque with this title was unveiled for this significant person in the New-Age ethnic life of Rusyns. The memorial was placed in a symbolic place – the restaurant Agát (Acacia) in Prešov. At the ceremony of unveiling V. Turok´s memorial plaque, this portrait by Michal Rebej could also be seen. Miloš Karásek, an author, scriptwriter and the director of the theatre as well as the organiser of the event welcomed those in attendance and talked briefly about the significant personality of theatrical dramatic advising; followed by the honoured man´s son Roman Turok. Mrs Elena Turoková devoted her life to her husband and two sons. Although V. Turok was not a role model for family life, for him, she was a safe haven until the last day of his life, she understood his life´s mission and with unusual patience she tolerated his weaknesses. That is why we should thank her. .... The Alexander Dukhnovich Theatre (ADT) was granted the honour and good luck to have Vasil Turok, as also thanks to him the theatre started its uncertain, experimental journey, by which it broke through not only on the Slovak stages but also abroad. How does Miloš Karásek, the director and dramatic adviser of the theatre and the organiser of this event, look back at these years? For Vasil Turok, the restaurant Agát became a part of his everyday life. Everybody who wanted to see him, knew they could find him there and he was ready to devote his time, answer their questions, discuss things and dispute various topics. He was actually some kind of informal discussion club for those who wanted to talk, who had something to say or who were looking for the answers to their questions. Likewise, the meeting in Agát on Vasil´s nameday was natural, without any formalities. There were no pompous words, the people who wanted to come gathered, talked, discussed, remembered... Just like in the times of Vasil Turok-Heteš. ... on June 10th to 12th, 2006. On June 10th, the theatrical group of the Aleksander Dukhnovic Theatre will present a play by Fyodor Dostoyevsky THE IDIOT, on June 11th PRINCOVE HALUŠKY (THE PRINCE’S HALUSHKI) by Uhorsky Simplicisimus and Vasiľ Turok. These two performances will take place in the theatre of Astorka Korzo `90. UJO VÁŇA (UNCLE VANYA) by Anton Chekov, taking place on the first stage of the country – The Great Stage of the Slovak National Theatre, will be the gala finale. the main character Jozef Patlikach (Myshkin Lev Nikolajevich) and Aglaya (Jaroslava Sabolová Sisáková). THE ALEKSANDER DUKHNOVICH THEATRE OF PREŠOV IN BRATISLAVA. place May 17th, 2006) on the main stage of the A. Dukhnovich Theatre in Prešov. A play by Albert Camus with actors from the theatrical group of this theatre was presided over by a guest director Jozef Pražmári. The premiere was partly funded by the Ministry of Culture of the Slovak Republic. Where? At the 60th anniversary celebration of the establishment of the Ukrainian National Theatre (which, since October 15th, 1990, has been called the A. Dukhnovich Theatre) in Prešov, the 50th anniversary of the Poddukelsky Ukrainian Folk Group, (now Poddukelsky Artistic Folk Group) and the 60th anniversary of the first premiere at the theatre entitled „Oj, ne chodî, Hrîc’u“ (Oh, Hric is not coming). These three jubilees are marked by the following dates: November 24th, 1945, December 6th, 1955 and March 2nd, 1946. They were all celebrated on one day - March 25th, 2006 – first in the big hall of the theatre, then in the Variety Show Hall in Prešov (above the Club cinema). And what happened to the electricity? 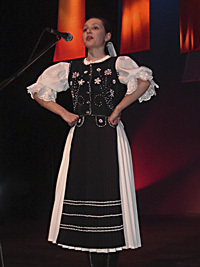 There were two power-cuts during the performances of the folk group Žobráci (Beggars) and PUĽS (the Poddukelsky Ukrainian Folk Group). This situation was wittily commented on by Michal Hudák, a member of Žobráci. On the next days, though, we could see that it was no joke. When we were passing the building of the theatre, some electricians were mending the electricity to prevent any potential power-cuts in the future. Anyway, let’s talk about the day of celebration. A talented singer Marianna Železná pleased everybody with her nice voice and beautiful Rusyn folk songs. It commenced in the foyer of the theatre as a part of a photographic exhibition opening by speeches by Oleg Dlouhý, a member of the Theatrical Institute in Bratislava, Sylvia Hroncová, the Head of the same institution and Marián Marko, the Director of the A. Dukhnovich Theatre. The celebration continued In the main hall of the theatre where Jaroslava Sabolová-Sisáková and Jozef Michal, the presenters of the programme read commemorative letters, one of which was sent by Melánia Nemcová, a successful former choreographer of PUĽS (the whole letter is below). Consequently, Marián Marko, the Director of the theatre gave a speech (below) and Eva Arvajová, the Head of the Culture Department of the Prešov Self-Governed District, which has been financing the theatre. So much about the official part of the celebration. I would like to mention again the exhibition of photographs of the theatre’s history, with the main focus on four honoured people who have passed away but who did a lot for the theatre and became famous – the actors Pavol Simko (born 7. 4. 1926 in Čukalovce and died 9. 12. 1981 in Prešov), Mikuláš Simko (born 7. 6. 1921 in Čukalovce and died 1. 4. 1982 in Prešov), Jozef Feľbaba (who was also the theatrical and administrative director of the theatre, born 12. 4. 1921 in Verbiaž in the Ukraine and died 2. 11. 1988 in Prešov). They were significant personalities to the theatre and it was the posthumous anniversaries of these four, which is why we celebrated seven jubilees. The author of the photographic exposition, O. Dlouhý, from the archive of the above institution talked with pride and emotion about the theatre and the honoured actors and reminisced about the memorable times he spent at the theatre with them. He also thanked the wives of the two late honoured actors, Anna Simkova and Mária Korbova (also former actresses of the theatre) and to Alexander Kučerenkov, J. Feľbaba’s son-in-law, who is a current actor at the theatre as well as to Jaroslav Sisák, a former actor and the theatrical and administrative director of the theatre, who loaned some of the photographs on display from their personal archives, which enriched the exhibition. The folk group Žobráci (Beggars) featuring their leader and showman Michal Hudak brought a lot of fun to the proceedings. 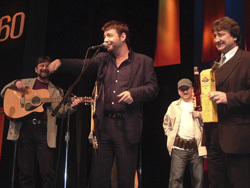 Michal Hudak invited the director of the theatre Marián Marko onstage to present him with a bottle of Metaxa as it was his nameday. After the opening of the exhibition in the foyer of the theatre and the opening of the celebration on the main stage, a nice cultural programme started. Jana Maľová and Slavomír Benko, fellow collegues from the Jonáš Záborsky Theatre in Prešov, performed excerpts from some musicals followed by Ján Ivan and Štefan Turanský, drummers/dancers; the folk group Žobráci featuring the showman of the evening, Michal Hudák Jr.; a young singer/soloist Marianna Železná, and all the actors of the theatrical group of the A. Dukhnovich Theatre performed a short excerpt from the play ‘The Idiot’ by F. M. Dostoyevsky and finally the audience could enjoy the performance of singers and dancers of PUĽS. The audience showed their appreciation of the programme with long and sustained applause although interrupted by the above mentioned blackout in the hall. Nevertheless, the people were cheerful and happy and this is how they left the hall for the festive buffet and the final party in the Variety Show Hall above the Club cinema accompanied by merry music. I am probably not alone in having expected more from the theatrical group of the theatre, which is nowadays among respected professional theatrical groups not only in Slovakia but also abroad. They have performed a lot of successful premieres and residencies that positively surprised the most demanding viewer and theatre lover alike, even the notoriously ‘pampered’ Bratislava audiences. 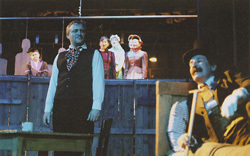 The theatrical group’s performance was very modest – the audience could only see a short excerpt from the play ‘The Idiot’. We all expected a dominating, excellent performance, the theatrical group is certainly capable of it. The festive day became a festive evening, which for many finished early in the morning as everybody was having fun and it was hard to leave. But everything must end and so our celebration of the above mentioned jubiliees of the Rusyn Institute and Rusyns had to end too. And again, hard everyday work awaits everybody in the Alexander Dukhnovich Theatre in Prešov and the Poddukelsky Ukrainian Folk Group to prepare new performances to please the audiences in Presov and other towns and villages in Slovakia and abroad. We wish all those who bring joy and enrich our spiritual lives as well as the Rusyn culture and culture in general to be able to continue in such a vein for many, many years to come. of the Dukhnovich Theatre in Presov, Slovakia – has died. … one of the first to, after 1989, realise that we can finally claim Rusyn as our nationality and our mother tongue. However, he not only realised that but also felt in his heart. He was a proud Rusyn from Habura at Medzilaborce, born in the depths of war – on January 8th, 1940. The first international theatre festival KARPAT FEST (Prešov, Slovakia) took place on June 4th - 8th, 2003 within cultural events of the 7th World Congress of Rusyns in Prešov, in Slovakia. The festival was supported by financial aid of USD 1,000.00 from Steven Chepa. The Alexander Duchnovič Theatre in Prešov (DAD) performed the play Adolf Ivanovič Dobrjanskij (staring E. Libezňuk in the middle) by K. Horák at the home stage at the festival. 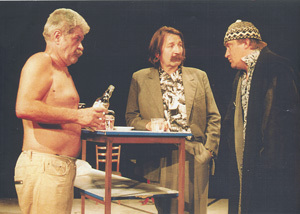 Within the 1st year of KARPAT FEST in the Jonáš Záborský Theatre in Prešov alto two actors of DAD performed: E. Libezňuk (on the right) and V. Rusiňak (in the middle) along with the member of drama group of DJZ J. Stražan. The main organiser of the 2nd international festival KARPAT FEST was the A. Duchnovič Theatre in Prešov. Members of DAD performed the play by Miguel Servantes DON QUIJOTE DE LA MANCHA (October 20th, 2004), staring with J. Tkáč. ■ The drama group of the Alexander Duchnovič Theatre from Prešov successfully performed the play Toaletárka (Toilet Lady) by the author and director Miloš Karásek in front of the sold out auditorium consisting of the Rusyns, Slovaks, and Hungarians (titling device for used for them) on October 1st, 2005 in the Theatre Merlin in Budapest within Slovak Culture Days. ■ Interesting performance of actors of the Alexander Duchnovič Theatre with the play Adolf Ivanovič Dobrjanskij by Karol Horák was held in the birthplace of a well-known Rusyn politician, cultural and social activist and revivalist of the Rusyns – Adolf Dobrjanskij (DOB December 19th, 1871) on October 23rd, 2005 in Rudľov, district of Vranov nad Topľou within the event Famous Natives Days. The Alexander Duchnovič Theatre in Prešov was established on 24. 11. 1945 pursuant to the decree of the Ukrainian National Council in Prešov. It was registered into the Register of Companies as “ Ukrainian National Theatre, cooperative society, s.r.o. (ltd) in Prešov“. The establishment was based on cooperation society. From the year 1969 up to 31st December 1997, the theatre was managed by the Ministry of Culture of the Slovak Republic. From 1st January 1998 to 31st March 2002 it was managed by the Regional Administration Authority in Prešov and since 1st April 2002 the theatre has been instituted by the Self-Governing Region of Prešov. The name of the theatre was changed to Alexander Duchnovič Theatre on 15th October 1990 by the decision taken by the Minister of the Culture of the Slovak Republic. The theatre has two artistic ensembles – drama ensemble and artistic folk ensemble - PULS. The Alexander Duchnovič Theatre is the only professional Rusyn theatre in the world, cultural and artistic establishment in the sphere of dramatic and folk activity. The basic theatre mission is setting up the conditions for the formation and public propagation of drama work and folk programs with the unique focus on the development of the cultural life of the Rusyns and the Ukrainians living in the Slovak Republic. In its beginnings the theatre plays were performed in Russian language and this fact was reflected by the drama repertoire, especially Russian classical literature. Throughout the fifties the theatre changed its orientation to the Ukrainian language. After the generation change in the eighties of the last century, the theatre gradually transfers to the Rusyn language. Since its establishment the theatre has presented 322 first-run drama plays and PUĽS from its establishment (on 5th December 1955) has presented about 50 first-run performances. 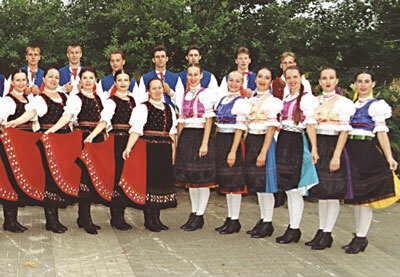 The folk ensemble PUĽS became very successful during its existence in the years 1965 - 1980. During the period the ensemble performed repeatedly in almost all European states and in the years 1969, 1972, 1978 in USA and Canada as well. We do wish many tremendous first-runs and performances as well as many satisfied spectators to the members of both artistic ensembles of Alexander Duchnovič Theatre. Professional theater based in Prešov, Slovakia. Established in 1946 as the Ukrainian National Theater (Ukraïns’kyi natsional’nyi teatr—UNT), the institution was intended to be a touring company to serve the cultural needs of Rusyn-inhabited villages in the *Prešov Region of northeastern Slovakia. During its early years, the theater performed plays in both Ukrainian and Russian, but by the 1950s it accepted Czechoslovakia’s policy of Ukrainianization and for over three decades gave performances only in literary Ukrainian. During the 1960s and 1970s, many of its actors were sent to the Soviet Ukraine for training. In 1956, a separate company within the theater was created for song and dance known as the Dukla Ukrainian Folk Ensemble—*PULS. The UNT/TAD has performed over 400 plays by local authors (both Ukrainian- and Rusyn-language writers), by classical Ukrainian dramatists, by Czech and Slovak authors, and by world classical dramatists. Beginning in late 1960s, there was criticism that the theater was unpopular because Rusyn villagers could not understand literary Ukrainian. 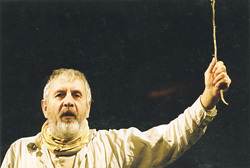 By 1986, the first plays were performed in Rusyn, and in 1990, under the direction of Iaroslav *Sysak, the theater changed its national orientation. Renamed that year the Aleksander Dukhnovych Theater/Teater Aleksandra Dukhnovicha, its repertory since then has been entirely in the Rusyn language. During the 1990s the Dukhnovych Theater worked closely with the *Rusyn Renaissance Society in Slovakia and since then has become a kind of all-Rusyn national theater, staging plays by Rusyns from countries other than Slovakia and performing with some frequency for Rusyns in Poland, Ukraine, Hungary, and Yugoslavia. The company also operates an experimental theater, translates dramatic works from other languages into Rusyn, and has participated with its Rusyn-language repertory at theater festivals in Britain, Sweden, Spain, and Italy. Among the directors of individual plays have been: Iurii *Sheregii, Iosyf Fel’baba, Iurii Zahrebel’s’kyi, Ivan Ivancho, and Iaroslav *Sysak. Most of its post-1989 Rusyn-language repertoire has been staged by Vasyl’ *Turok-Hetesh. Popular actors have included Iosyf Korba, Aleksander Kucherenko, Anna Symko-Klets’, Mykola Symko, Pavlo Symko, Tamara Symko-Pazdernyk, Ivan Stropkovs’kyi and, during the Rusyn-language phase of the theater, Igor Latta, Vasyl’ Rusyniak, and Osyf Tkach. Bibliography: Ivan Matsyns’kyi, ed., 10 rokiv UNT (Bratislava, 1958); Iosyf Fel’baba, ed., 25 UNT (Prešov and Bratislava, 1971); Iurii Datsko, ed., Pionery ukraïns’koho profesional’noho teatru v ChSSR (Prešov, 1981); Iurii Datsko, ed., Sorok rokiv UNT (Prešov, 1985).